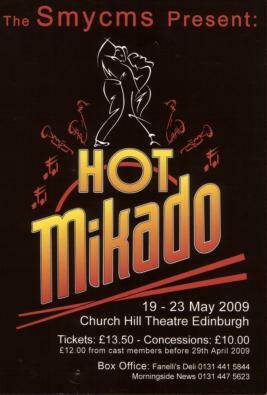 The 2009 production of Hot Mikado was a complete jump away from our previous show Red Hot and Cole which was a review type show showcasing the songs of Cole Porter. With Hot Mikado it was light opera from Gilbert and Sullivan with added spice. With the score transmuted into blues, swing, hot gospel and scorching torch songs, and “Three Little Maids” an Andrews Sisters show stopper, this zoot suited, tap dancing, lindy hopping , jitterbugging, all singing, all dancing spectacle is destined become a Smycms legend you’ll not forget. Hot Mikado is strongly based on The Mikado by Gilbert and Sullivan. East meets West in this hilarious 1940’s updating of a G&S classic. Nanki Poo, the son of the Mikado (masquerading as a 2nd trumpet player), arrives in the town of Titipu looking for the beautiful Yum Yum. He learns that she is to be married to the Lord High Executioner, Ko Ko. Meanwhile the Mikado demands Ko Ko execute someone within the next month. Nanki Poo agrees to be executed as long as he can spend one month as Yum Yum’s husband. The plan goes awry when the Mikado makes a surprise visit to Titipu and brings with him Katisha, an older woman who has been after Nanki Poo as her toy boy! Ko Ko is persuaded to marry Katisha , Nanki Poo is spared execution and remains married to Yum Yum and, as with all musical comedy, everyone lives happily ever after. “DELVING INTO THE IRREVERENT HEART OF GILBERT AND SULLIVAN” Hot Mikado, Church Hill Theatre, ***, Thom Dibdin, Edinburgh Evening News Thursday May 21st 2009. Artistic Director – Laura Jordan Reed, Musical Director – Alison Rushworth, Choreographer – Laura Proudfoot.